"The Richardson Light Guard has a long and colorful history in Wakefield. Chartered in 1851, Company A, Sixth Regiment M.V.M. took as its local name 'the Richardson Light Guard' in honor of Dr. Solon O. Richardson. Historical references note that he had been 'zealously interested in the formation of the company and practically helpful in its membership.' 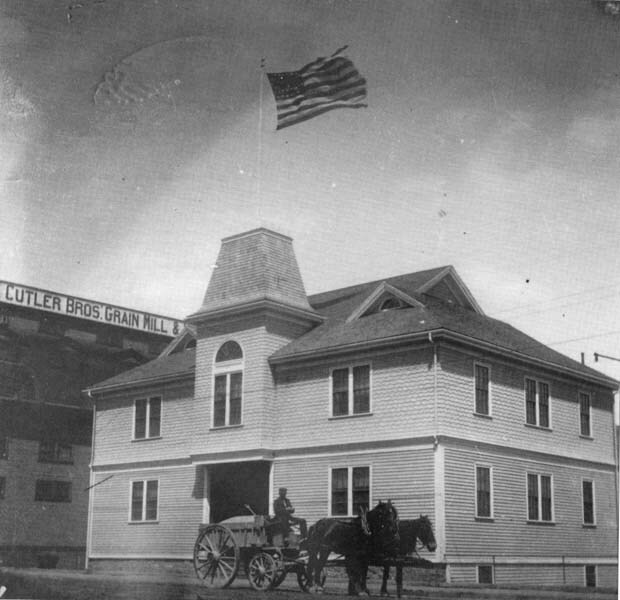 The Richardson Light Guard was without a permanent home until 1894, when an armory was built by the Town just south of the corner of Main and Water Streets. Prior to that the company occupied quarters in several places, with the Town of Wakefield paying rent with a portion reimbursed by the state. On May 1, 1894, Town Meeting voted to appropriate $12,000 to build an armory. Soon after, a lot of land near the Town Hall and next to the Cutler Bros. grocery and grain stores was purchased. The building, complete with an attached drill shed, was dedicated on February 15, 1895. This armory was short-lived, however its demise the result of a fire which occurred on July 6, 1991 after a lightning bolt struck wires at the street corner, setting fire to Cutler Bros.' The flames spread quickly to the armory, but were kept from destroying the Town Hall and the Henry F. Miller & Sons Piano factory by the diligent efforts of firefighters. Total damage was set at $60,000. The armory fire did not 'burst out in real earnest' until the Cutler building was 'practically' flat. This allowed Company A members to rescue guns, live ammunition, uniforms, trophies, pictures and furnishings. When the fire spread to the upper story of the building, more than 2500 rounds of ammunition (all blank cartridges) exploded with the sounds of battle. After the fire, the company used the old Town Hall auditorium as a drill hall until a new armory was put into service aftr its dedication in January, 1913. The old armory is now the site of the Hodgdon Building. " -- Text from calendar by Jayne M. D'Onofrio. Photo courtesy of Frank Ripa. “Company A, Sixth Regiment Armory (Richardson Light Guard), Main & Water Street, circa 1895,” NOBLE Digital Heritage, accessed April 22, 2019, https://digitalheritage.noblenet.org/noble/items/show/6837.